Served with an apple, walnut and baby herb salad and split balsamic dressing. This recipe was devised by Shanice Parris, Coeliac UK’s Up and Coming Gluten-free Chef of the Year 2010. 1. Slice each beetroot into 0.75cm thick rounds and transfer to a shallow dish. Pour over the oil, vinegar, honey and some salt and pepper and leave to marinate for 20 minutes. 2. For the goat’s cheese mousse, soften the goat’s cheese in a bowl with a spoon and stir in the cream, chives and salt and pepper until smooth. Transfer to a small piping bag. 3. Drain and dry the beetroot slices, reserving the marinade to become the dressing. 4. Place one slice of beetroot on each plate and pipe a layer of goat’s cheese mousse on top. Repeat this sequence and finish with a final slice of beetroot. 5. 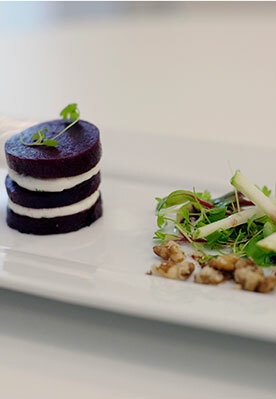 Place some micro herbs alongside the beetroot stack and top with some apple match sticks. Scatter over chopped walnuts and finish with a drizzle of the split balsamic dressing.